Upsetters by Foundation Cigars - Buy Premium Cigars Online From 2 Guys Cigars . 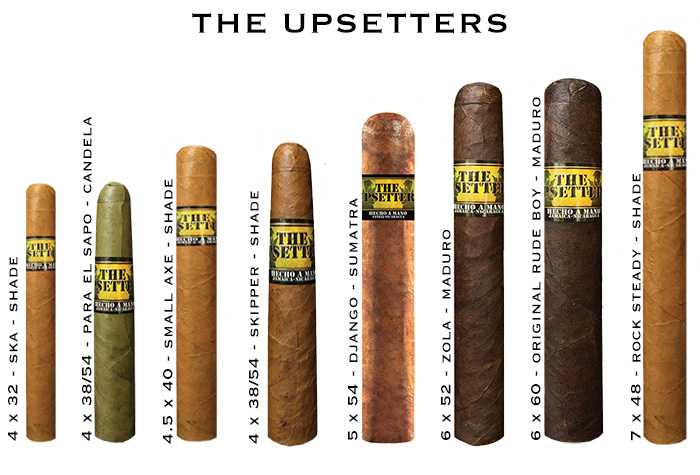 THE UPSETTERS is a unique blend of Jamaican and Nicaraguan fillers. Jamaica has an interesting history of hailing the underdog - the anti-hero who battles against the odds. Upsetters stir things up. They're the rude boys who, in the 1960s, watched old spaghetti westerns and identified with gunslingers like Django and films like "A Fistful of Dollars." Upsetters created reggae music, fought tyranny, battled Goliath - and smoked old-style Jamaican cigars. Master Blender Nicholas Melillo, traveled to Jamaica for Bob Marley's 70th birthday in February, 2015. After the celebrations he went searching the island for cigar tobacco and the old style Jamaican blending techniques. In the mountains outside Montega Bay, Kingston, and the town of May Pen he found both. Melillo met one of the oldest cigar tobacco growers on the island, growing cow tongue, a tobacco cultivated and blended in those hills since indigenous Arawah planted it thousands of years ago.